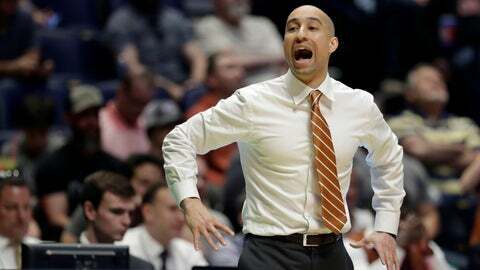 AUSTIN, Texas (AP) — After three years in Austin, Texas coach Shaka Smart has the Longhorns back where he found them: winning in the regular season and losing early in the NCAA Tournament. That wasn’t good enough to keep predecessor Rick Barnes around. So entering the fourth season of a guaranteed seven-year contract, just how warm is that seat under Smart heading into the 2018-2019 season? He wouldn’t know, or at least he doesn’t care enough to take the temperature. “I don’t sit down,” Smart joked. He can smile because he knows athletic director Chris Del Conte has repeatedly voiced his support for Smart. But Smart is also just 50-50 at Texas. Smart’s Longhorns rebounded from a disastrous season in 2016-2017 to return to the NCAA Tournament in 2018. Their stay was short as they lost in the first round for the third consecutive time and fifth in the last seven tournament appearances. For the first time in a couple of years, Smart isn’t relying on a freshman to come in and take over his team. Two years ago, it was Jarrett Allen. Last year, it was Mo Bamba. Both were expected to be one-and-done players and both went on to be high NBA draft picks. Senior Kerwin Roach should lead the way. Roach averaged 12.3 points and consistently draws the toughest defensive assignment. The Longhorns open the season at home Nov. 6 against Eastern Illinois. Forward Jericho Sims showed great potential last season but delivered in short spurts. Sims added muscle to go with his spectacular leaping ability. He averaged five points and 3.9 rebounds last season and will be expected to deliver a lot more as a sophomore. Texas struggled to close out games, losing eight times in games it led in the final minute or got to overtime. Junior guard Andrew Jones‘ season was cut short by a leukemia diagnosis and treatment. He has been trying to make a return to the team. He was working out with teammates when practice resumed but Smart wouldn’t commit to whether Jones will play this season. Then Jones fractured a toe in practice, setting him back again. If he plays, it will likely come at home where he’ll have a chance for an emotional embrace from Texas fans. When Smart had Allen and Bamba, Texas had post players who were the primary focus of the offense. The Longhorns should be much more guard-oriented this year. Texas didn’t win consecutive games in the Big 12 during the regular season in 2017-2018.